My daughter stayed up late tonight, reading two chapter books. I’m thrilled. In my world, a kid can stay up all night if they want, if it’s with a book. 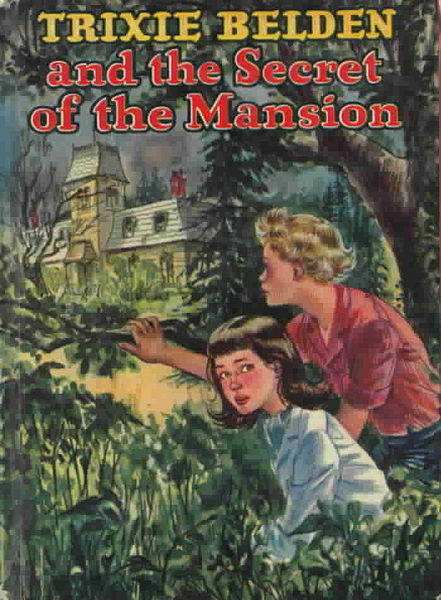 I used to stay up as late as I could when I about her age, reading Trixie Belden mysteries. I wanted to be Trixie–a bit of a misfit but a smart one, who made good choices in friends, who sought adventure, feared little, always faced the consequences of her always well-intended actions with sheepish regret and/or righteous indignation. When I was in the sixth grade, I tried to write my own mystery novel. The heroine was named “Cassie.” That’s all I remember. I don’t think I got past the first few pages. I was too focused on the character development, not enough on plot. Plot. What happens, and then what happens next, and then what happens after that. It’s vitally important in writing any story, especially a mystery. Or, apparently, in writing a blog. I wrote something a while back, on impulse, as a reaction to some disturbing news I had learned about a friend. I planned to act on what I wrote, and share with that friend my honest reaction. I even wrote about the fact that I’d see her face to face, relatively soon, that I’d do my best to walk my talk, as it were. Who did? Quite a… Mystery. My friend and I both are very happy that we talked. I apologized, and told her that I would have said every single thing in person, to her face, the minute the opportunity presented itself, as I was sure it would. She knows that to be true. She says she respects my opinion and values our relationship, and would have been very upset if our friendship dissolved because of her actions–actions which at the time, I didn’t fully understand. After talking, I understand her situation a bit better. My friend knows exactly how I feel, she respects how I feel, and most important, she knows I will not stop being her friend. She had earlier, on her own, come to the same conclusion about the news that had disturbed me so much. I am greatly relieved. Back to The Mystery of the Letter. Somebody had very good intentions in passing it on to my friend. But, had I not reached out to my friend, on a very different matter, that letter (my blog post) would have carried more weight for far longer than warranted. My writing was a reflection of my thoughts at a point in time. It was not a fully formed plan of action. It was just the first few pages of a mystery that I was trying to wrap my head around. It was not meant to be a plot’s outline. But given what happened, and what happened next, and what happened after that? Given the literal pushing of an envelope, to advance this story? I feel like an honest friend. I feel like Trixie Belden. Maybe the mystery won’t be solved. Probably doesn’t need to be, even though it could be, easily. It’s nice, in any event, to know that I’m not the only Trixie Belden out there. First of all, I loved, loved Trixie Belden. I didn’t know we had that in common! Second, I have, unfortunately, been known to yell at the girls for reading late. And it feels so wrong. But 11:00 p.m. on a school night? I’ve had to hide the books. And finally, whoa…someone printed what you wrote and gave it to her? That is intense – and a bit heavy. I’m glad it all worked out ok…. Yeah, 11 on a school night might require some book hiding over here, too. And the fact that you too loved Trixie–that’s awesome and not at all surprising. And yes, intense that somebody would leave a printout of a blog post. Everybody does what they are able and want to do. Nothing more, nothing less. I will always be happy to provide words. Always able, always want to.